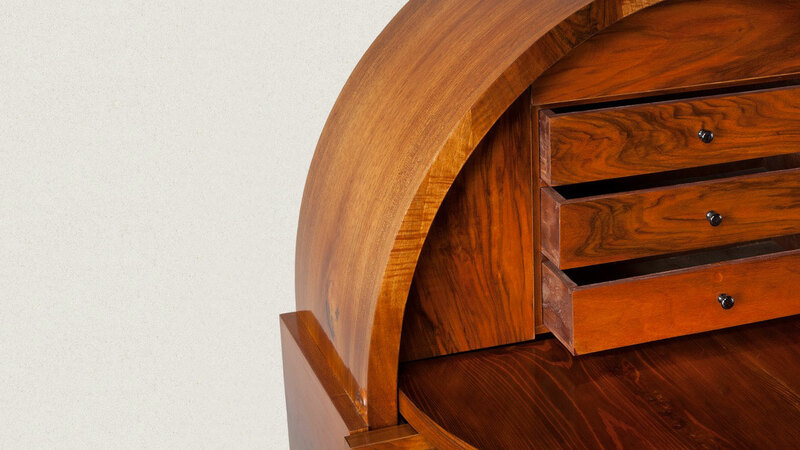 When we designed the Egg Secretaire, we set our hearts upon a quite unusual shape. 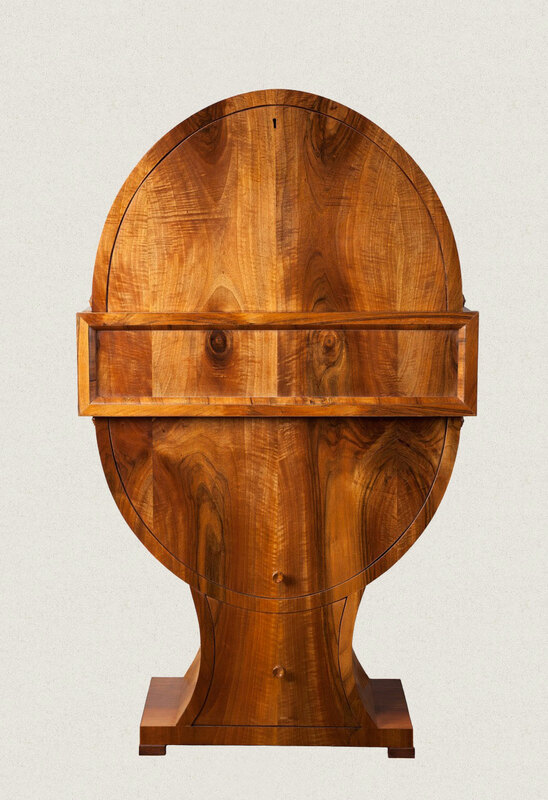 We based this secretaire on a work of art produced by a Viennese master cabinet maker in 1816. However, not content with producing a mere copy of an admittedly brilliant piece of work by this outstanding craftsman, we revisited and further developed the design, leaving our own, distinctive mark upon it. 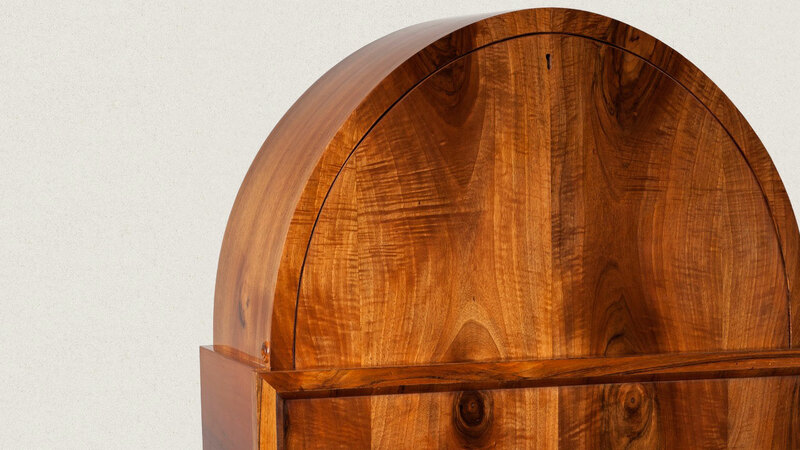 This secretaire's unusual curves are almost impossible to create in this size using the techniques of the time, without sacrificing certain details and functionality. Instead of settling for simplistic solutions and compromises, we took a more difficult route, full of challenges. If no one had succeeded in devising the necessary techniques since the 19th century, we decided we would have to do so ourselves. If a shape was impossible to create, we would create it. If the techniques available to 19th century master craftsmen were insufficient, we would find new solutions. A clear, harmonious shape immediately draws the eye. When designing this piece, we relied on classic techniques from the period. It is made with a pine base; while the interior and external surfaces are finished with high quality, fine-grained walnut veneer panels. We paid particular attention to selecting high quality raw materials, using only top grade veneer panels with outstanding grain. The finishing touch was to add a high-gloss shellac lacquer, then buffed to a brilliant shine. the Fabergé among fine furniture. When the writing panel folds down the secretaire’s inner brilliance is revealed. The Classic model has an orderly interior with 3 drawers for jewellery and documents, but this interior can be altered at the customer’s request. A name or motif can be inlaid on the horizontal drawer at the front, transforming the secretaire into a personalised gift for someone special. 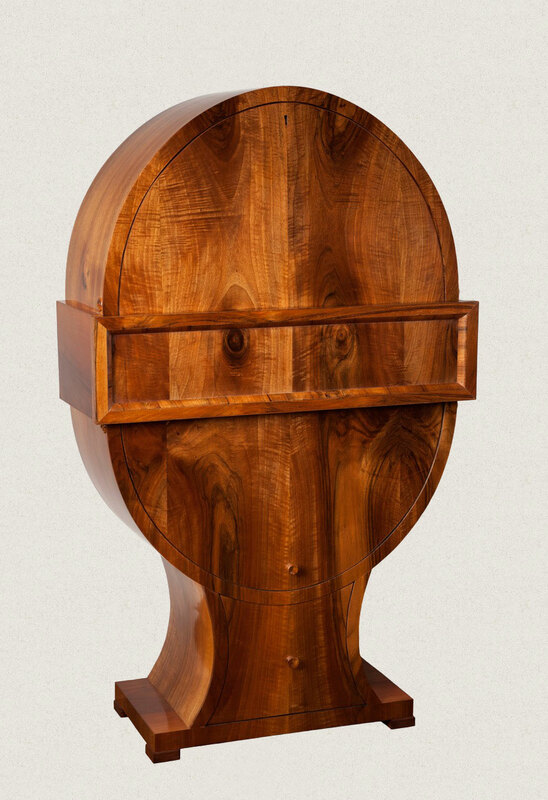 The Egg Secretaire is being produced in a limited series of 55 only. Its dimensions are: 126 x 73 x 30.5 cm. The final price depends on any special requirements of the person commissioning the piece.